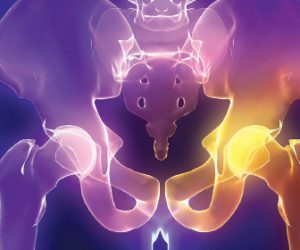 Easing hip joint pain - any ideas to help? After walking more than two miles or playing nine holes of golf, my hip socket hurts. I am wondering if there is anything I can do to alleviate this. I do have osteoarthritis in my hands and it could be that it is spreading its wealth around this 46-year-old body. I am not overweight and have been gradually adding distance. Any ideas that would help me to ease hip joint pain? Our hips get very tight as we get older, and we do little to stretch them out. If you actually do have arthritis in your hip joint, stretching regularly may help to ease the discomfort. Usually, though, arthritic joints are sore upon beginning activity and discomfort eases as you loosen up. You may have a gait problem that is aggravating your hip, or some other condition. The important thing is to have the discomfort clearly diagnosed by your doctor, and then proceed with a plan of action.